This Damascus Steel Warrior katana sword is as elegant as it is functional with powerful full-tang Damascus steel construction. The blade is hand sharpened with a deep blood groove spanning the blade. The handle features genuine ray skin and is graciously wrapped with heavy nylon cord and accented by zinc alloy hardware and a custom-designed dragon tsuba. The full-tang construction of this sword allows you to put it to use for slashing and slicing with ninja ferocity while the elegant accents and attention to detail give it a polished, one-of-a-kind designer look and feel. 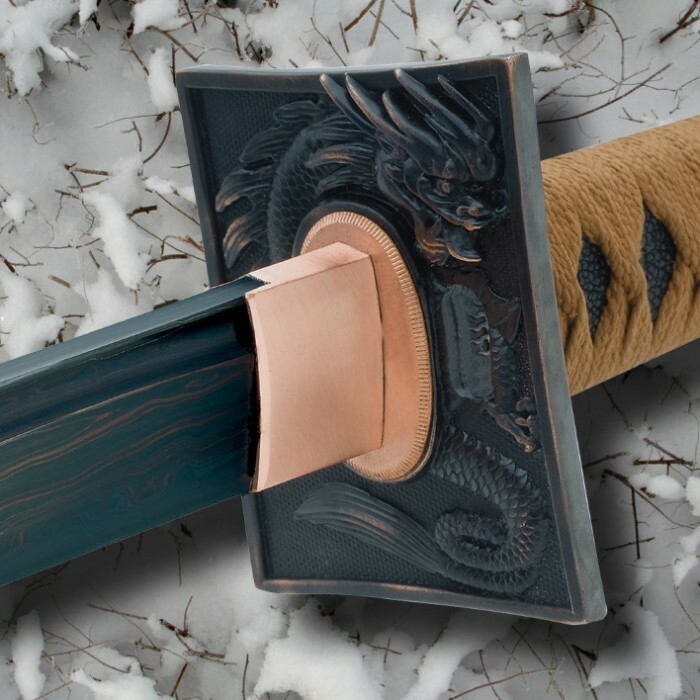 An elegant high-polish lacquered scabbard houses the mighty 28 1/8" black Damascus blade. 40 1/8" overall. You want a functional sword that can hack and slash then this is for you. Overall a beautiful piece of art. Would recommend to everyone who wants a great sword at a decent price. Extremely satisfied. I received this sword in the mail yesterday. Straight out of the box I was impressed. The black damascus steel is beautiful and the sword came sharp. The weight and feel of the sword in hand was excellent as well no rattle or shaking due to the full tang construction. I could not be happier with this purchase. Great sword. however, it would be better if the logo and the manufacturing info wasn't on the blade. Not a bad sword. This is my second sword that I have bought from trueswords. I have to say I was extremely excited to get my sword but when I opened the box I was a little disappointed. I don't believe it was balanced well and it looks like the hamon was painted on. Also mine does not fit well in the scabbard. Otherwise not a bad display sword. I do like that it is different and unique. This is my first sword I have purchased from Trueswords. The sword arrived within a week of order, which is unusual since I live in a remote town in SE NM. 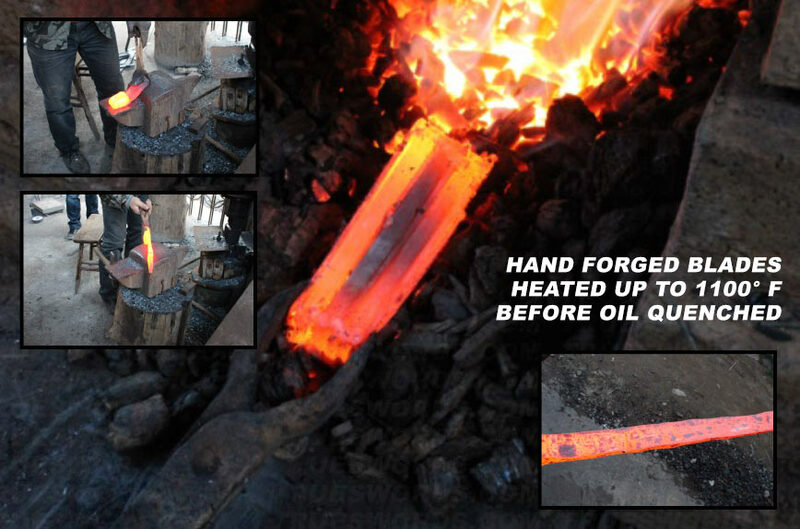 I am extremely satisfied with the workmanship and quality of the blade. The box it came in is also very nice, I was not expecting such quality. The blade arrived extremely sharp, as sharp as my professional cutlery I use to cook with (I am an amature chef). I imagine I could cut paper thin slices of tomatoes with it if I so desired. 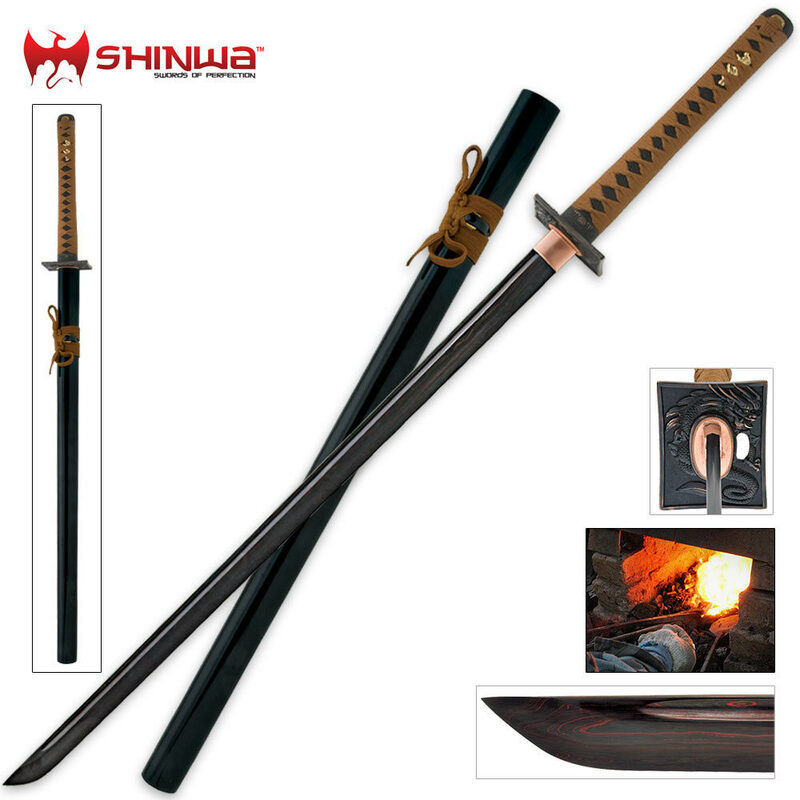 This is a quality sword and I would recommend it to anyone interested.